To borrow from a line from an old Disney song, the Golden Mean is “a tale as long as time” as it traces back its origin to Aristotle, the Greek civilization and even made its mark on Greek mythology in the tale of Daedalus and Icarus. Taking a cue from the Golden Mean and the great works of artists throughout time that have espoused the genius of this simple ratio, Camilla and Marc collaborated with muse, artist and photographer Ana Kras to host and create a live art installation for its Fall Winter 2019 presentation in New York this week. Creating a live set that paid homage to the great works of Da Vinci and Botticelli, Kras reinterpreted, abstracted and built a set that reflected the symmetry, proportion and harmony reflected through the precise proportions of the Golden ratio, an equation that has inspired great thinkers of all disciplines like no other in the history of mathematics. 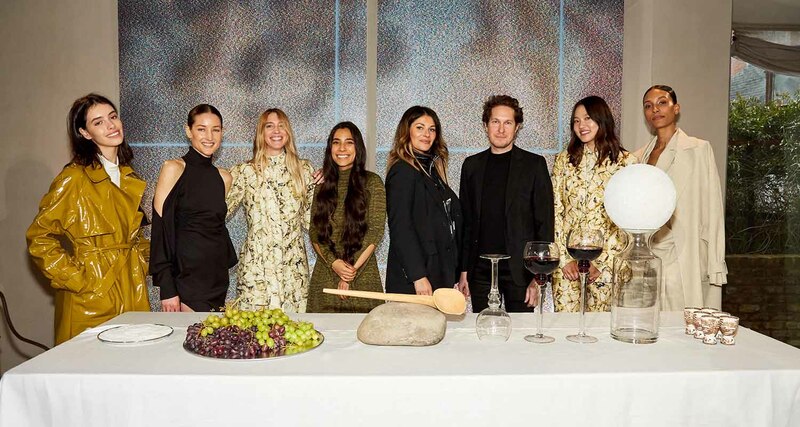 TyLynn Nguyen, Bianca Valle, Caroline Ventura, Nicole Della Costa, Gia Seo and Andrea Mary Marshall – six women with diverse views and who bring energy to the fashion world were styled in the collection and formed part of the live set, creating a very visual and artful moment for VIP guests. Accessories were delivered throughout the space, artfully styled and imagined with colorful metallic and vibrant textures creating a modern and playfully constructed collection space. The result – a surprisingly unique view on fashion with a mathematical flavor that is not only beautiful but also a work of art.